Savor every moment of your North Myrtle Beach vacation day when you reside at Bermuda Run for your family’s beach vacation. This North Myrtle Beach resort is beautifully situated on a lake and is still right across the street from the beaches of the Cherry Grove section of North Myrtle Beach, South Carolina. There are nice amenities at this North Myrtle Beach resort which is a mid-size retreat. Bermuda Run is easily found from Highway 17, the main thoroughfare that extends from one end of North Myrtle Beach, SC to the other. There are two buildings with four stories each of North Myrtle Beach condominiums. Covered parking is available on the ground level beneath these buildings, which are perched on stilts. Both buildings of Bermuda Run feature North Myrtle Beach vacation rentals that each has a balcony. And these balconies all face towards the inviting pool deck. The pool deck at this North Myrtle Beach resort is centrally located and it boasts a sparkling blue swimming pool, a kiddie pool with shallow water so the toddlers can safely splash and play, and a hot tub that is a wonderful respite after playing Myrtle Beach golf or shopping the nearby outlet malls all day. The Bermuda Run clubhouse anchors one end of the pool deck and is a hub for activity year round. At the other end of the swimming pool is a wooden deck that extends over the lake. The views are tranquil from the pool deck and the setting is peaceful as you overlook the lake while being just steps away from the hustle and bustle of the North Myrtle Beach beachfront. Spend one whole day of your North Myrtle Beach vacation relaxing among the swaying palm trees and resting under a pergola. Blue skies and sunshine are about all you need for a memorable afternoon at the Bermuda Run lakefront pool deck. Return to the pool deck at dusk and watch the sunset over the lake, a perfect ending to an ideal North Myrtle Beach vacation day. 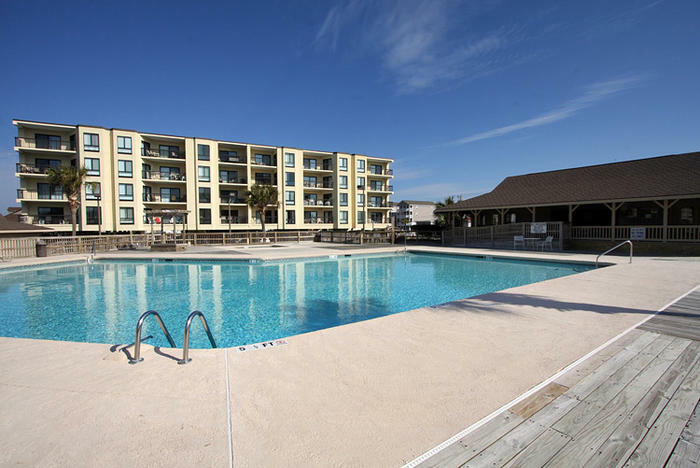 Take your pick of spacious North Myrtle Beach vacation rentals at Bermuda Run. There are two-bedroom North Myrtle Beach condominiums that sleep six people and three-bedroom North Myrtle Beach vacation rentals that sleep six, seven or eight people. All of these North Myrtle Beach rentals have two baths each for your convenience. Additionally, all of these North Myrtle Beach condominium rentals feature a kitchen that has everything you need. The appliances in the kitchens of these North Myrtle Beach rentals are full-size and there is also a dishwasher in each of these kitchens. Open the cabinets and find far more than a coffee maker. There are dishes, cookware and utensils so you can make breakfast for your family or prepare some appetizers for your golf buddies when your North Myrtle Beach vacation brings you to Bermuda Run in the Cherry Grove section of North Myrtle Beach, South Carolina. A well furnished living room adorns every North Myrtle Beach vacation rental at Bermuda Run and the master suites are so comfortable and welcoming. Both of these rooms, the living area and the master bedroom, open to the balcony at Bermuda Run. You just might discover that you spend a large amount of the time you are in your North Myrtle Beach condominium on the balcony. The fresh air and sunshine is tantalizing and watching all the activity of the pool deck is entertaining. There are other amenities in these condos in North Myrtle Beach, SC and they include televisions and at least one DVD player. There is a washing machine and clothes dryer in each North Myrtle Beach rental at Bermuda Run. Some of these North Myrtle Beach condominiums even have Internet access. It is quite obvious that whether you spend your time in the comfort and privacy of your Bermuda Run condominium rental, on the pool deck of this North Myrtle Beach resort or across the street on the white sandy beaches, you will be pleased. Furthermore, North Myrtle Beach amusements and attractions are right around the corner from this resort. Myrtle Beach golf courses are plentiful, more than 100 of them, and so they are easily found right down the street from Bermuda Run. A fishing pier, marinas with parasailing opportunities, shopping centers with your boutique stores and a plethora of restaurants with delicious food on the menu are minutes away from this North Myrtle Beach resort. Live entertainment theatres such as The Alabama Theatre, House of Blues, Carolina Opry and Pirates Voyage are down the street from this second-row North Myrtle Beach resort, too.